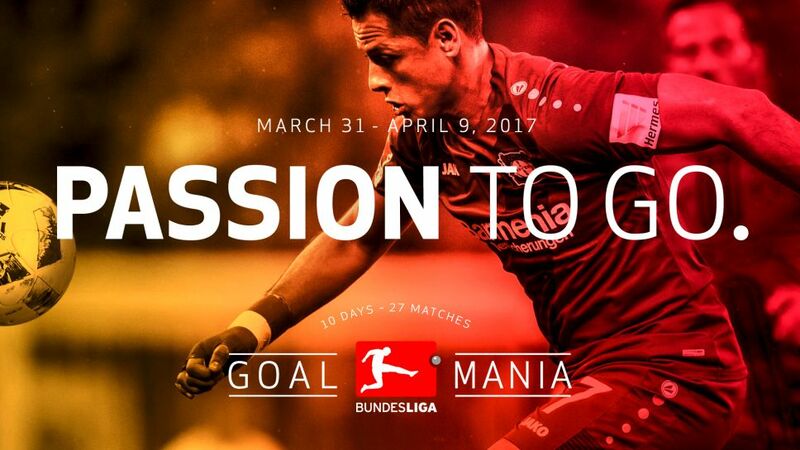 The 2016/17 Bundesliga season is entering the finishing straight under the slogan “BUNDESLIGA GOALMANIA”. The decisive stage of the world’s goal-richest top division will commence on 31 March with three action-packed matchdays that are set to be a real treat for the global fan community: 27 decisive encounters in ten days within a unique atmosphere in stadiums that enjoy the strongest spectator following. The highlights include the German “Klassiker” pitting FC Bayern Munich against Borussia Dortmund (8 April) and the prestigious “Revierderby” between FC Schalke 04 and Borussia Dortmund (1 April). They can be experienced live via Bundesliga’s media partners all around the world. Will record champions FC Bayern lift the Bundesliga Meisterschale once again? And how will Dortmund and Schalke, who are also participating in the Champions League and the Europa League, fare? Can the rising stars of RB Leipzig continue their ascent? Who will find themselves relegated to Bundesliga 2? And who will win the race to be the Bundesliga’s top scorer? Pierre-Emerick Aubameyang (Borussia Dortmund), Robert Lewandowski (FC Bayern München) or Anthony Modeste (1. FC Köln)? BUNDESLIGA GOALMANIA. Ten incredible days which will shape the league of the reigning world champions. During BUNDESLIGA GOALMANIA, Bundesliga legends will also be spreading the spirit of professional German football around the world. Former Germany goalkeeper Jens Lehmann (FC Schalke 04, Borussia Dortmund) will be explaining first-hand the fascination of the Bundesliga in the United States, while former Mexico international Pavel Pardo (VfB Stuttgart) will be doing the same thing in his native country. In addition to numerous activities, they will both be featured by Bundesliga TV partner FOX. Full information on BUNDESLIGA GOALMANIA can be found on the Bundesliga website BUNDESLIGA.COM (English, Spanish, Japanese) and BUNDESLIGA.CN (Chinese) as well as on Twitter (@BUNDESLIGA_EN and @BUNDESLIGA_ES), Instagram (@BUNDESLIGA_EN) and Facebook (@BundesligaOfficial).